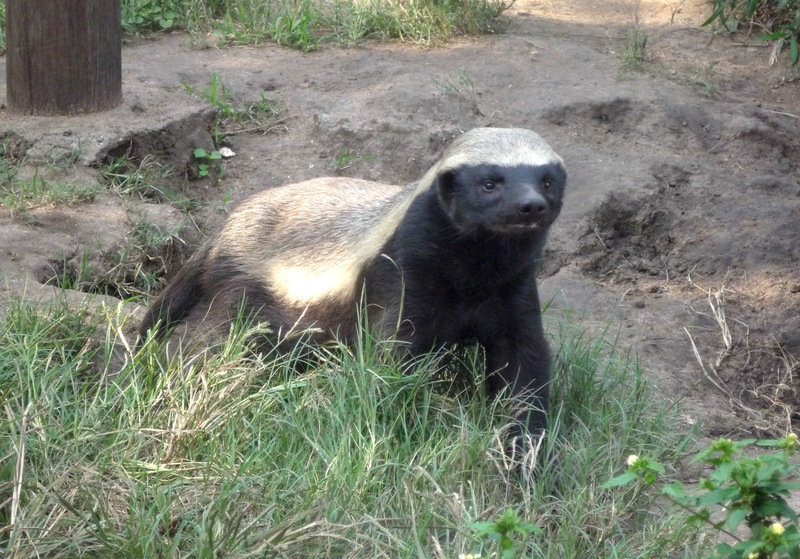 Today I want to write about an animal that is ranked by the Guinness Book of Records as the most ferocious in the world, the honey badger. These ferocious little animals grow to about a metre long. They are also known as ratels and aren’t actually a true badger, but are more closely related to weasels. They are omnivores and have a wide-ranging diet, eating snakes, lizards, tortoises, small birds and mammals, eggs, scorpions, grubs, insects, berries, fruit, roots and bulbs. They like eating honey and regularly raid bee hives. They have a reputation for being very clever and ferocious. They are able to use tools for climbing and are fearless when attacked. They are excellent fighters, using their powerful claws, sharp teeth and tough skin to protect themselves from even the largest animals, including lions, leopards and buffalo. Their skin is also very loose, which means that even if they are being bitten, they can turn around and bite their attackers. Honey badgers are very common and are able to live in a wide range of habitats from tropical rainforests to savannah grassland. They live throughout southern Africa, western Asia, the Arabian peninsula and India. Are there any other interesting facts that you would like to share about honey badgers?